louisgray.com: Could You Replace Facebook.com With a Desktop Client? Could You Replace Facebook.com With a Desktop Client? Even as many desktop applications are migrating to the Web in the form of Web services and Web apps, some popular Web services are going the opposite way, as desktop clients are created for popular social networks, or to bring alerts to changes on the Web outside of your browser. From the seemingly-ancient desktop RSS readers to the more mainstream Twitter clients, we have seen the migration is bidirectional. But what about Facebook? The site considered to be the second-largest by some measures and the largest overall by others on the entire Web, jousting with Google, doesn't seem to have the groundswell of development focused on bringing updates from the site to the PC as Twitter does, but there are options. The easiest route to getting Facebook to the desktop for the most connected social media users is through existing Twitter clients which also support Facebook. TweetDeck and Seesmic let you add your Facebook account as a supported account, as does Brizzly for the Web. In the cases of Seesmic and TweetDeck, Facebook updates scroll down in a single column alongside other services you have connected - from Twitter, of course, to recent adds, including Foursquare, Google Buzz or LinkedIn. But in addition to these Twitter clients who give Facebook a passing nod, there are a few dedicated Facebook desktop apps that leverage Adobe AIR, bringing the network to you. Similar to the Twitter clients, the simply titled "Facebook for Adobe AIR" shows all news feed activity in a single column stream, and lets you comment or like from within the app, while any links take you the Web browser. It's basic, but does what you would expect. As you have to visit the app to see updates, the benefit to running the client on its own is minimal over the Web experience, unless you just don't want your browser to be on constantly. In contrast, a much newer app, called "Facebook Desktop", which has the somewhat enviable URL of www.facebookdesktop.com, eschews the column and stream format, simply showing you alerts, which if they gain your attention, are a click away. 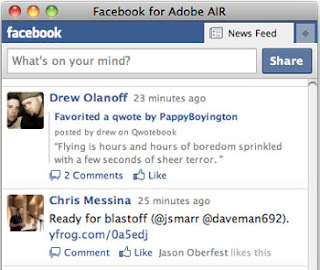 This is much like the FriendFeed Desktop Notifier, introduced before SXSW back in 2009. While it is an AIR app, like the others, it doesn't have that heavy feel on your laptop, and doesn't demand any screen real estate. 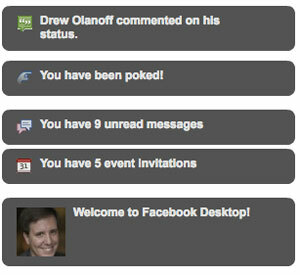 Once you open Facebook Desktop, you get instant updates to messages you have waiting, whether you have events pending, or even if you have been poked. As new entries on your friends' feeds are added, they pop up to the foreground and melt away if they don't draw your interest. You might find yourself looking around for the app window, but the minimalist approach doesn't have a central node at all. As ephemeral as some social updates can be, this isn't necessarily a bad thing. So you can be working on whatever other app you want on your desktop and still have Facebook notifications float to you. Clients for Twitter have often been at the foreground of innovation for the service's platform. In this case, that fact has not been true for Facebook. Maybe their Web site is good enough. But if you want something else, there are alternatives. Who Cares About LeBron? Drew Is Cancer Free! Should Social Profiles Live On When People Die?